On September 1, 2016 John J. DeGioia, president of Georgetown University, said that it would apologize for its history with slaves and that their descendants would get admissions priority. His offer to the descendants fell short of the request for a scholarship fund from many descendants but a process has been put in place to continue the dialogue about further steps. It was a shock to many that a university operated by Jesuit priests owned slaves. 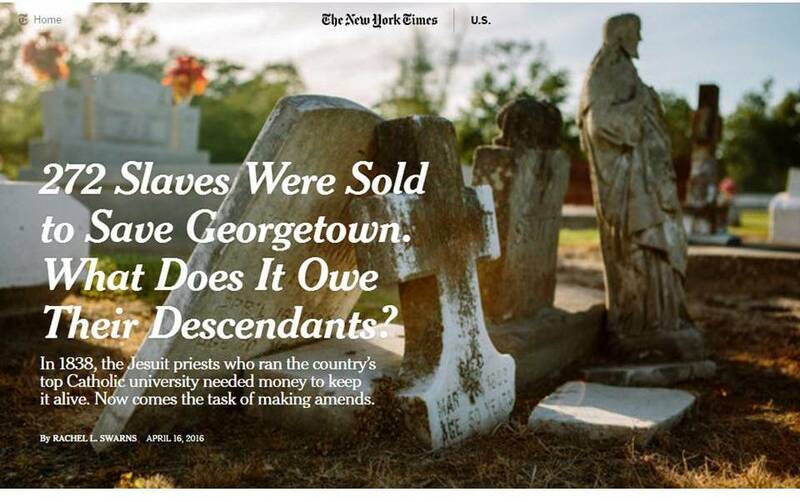 Even more startling was the revelation that Georgetown priests sold 272 slaves to plantation owners in Louisiana in 1838 to provide funds to get the University out of debt. The genesis of this apology was a family history project! A woman hired a professional genealogist to learn about her Louisiana ancestors. “My Goal Was Just to Tell My Story” Profile of Patricia Bayonne-Johnson, descendant of one of the Georgetown slaves. The full text of President DeGioia's message can be found here. 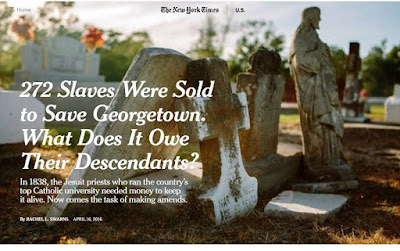 May 2016 NY Times article which profiled several of the Georgetown slave descendants included this comment: "I Have A Million Questions for My Ancestors Now"
September 2016 Article on Slate: How Do Descendants of Slaves Find Their Ancestors? The inventory of documents related to slavery at Georgetown. One page in the Georgetown Slavery Archive Related to Descendants stories that I found particularly interesting. How will Georgetown offer admission priority to slave descendants? What level of proof will be required for descendants to become eligible for admission priority? Will there be a searchable database of the Georgetown slave descendants? Will this effort by Georgetown be a model for other institutions to follow? Why were the slaves sold in the 1830s? operation of the plantations with slave labor to be an inefficient way to fund the Jesuits’ activities. Georgetown College was the most expensive and ambitious Jesuit project in this period. How did the sales transpire? When Fr. McSherry was head of the U.S. Jesuits and Fr. Mulledy was head of Georgetown College in the mid 1830s, Fr. McSherry authorized several sales of enslaved people in small numbers. Roughly $16,000 (adjusted for inflation: about $400,000) from these sales went into Georgetown’s operating budget. In 1838, Frs. McSherry and Mulledy switched offices, and Fr. Mulledy directed the sale of the remaining slaves. Most of the people were sold to Henry Johnson and his associate Jesse Battey. Mr. Johnson had been a governor of and senator from Louisiana. At the time of the sale, he was a U.S. congressman. He was also the uncle of a Georgetown student. How much revenue did this sale generate? The agreed upon price was $115,000. $17,000 (about $500,000 today) of a $25,000 down payment was used to pay down Georgetown’s building debt that had accrued under Fr. Mulledy’s leadership of the College in the earlier years. On account of Mr. Johnson’s own financial difficulties, the Jesuits appear never to have received the full $115,000. What were some of the terms of the sale? used to pay off debt or go to operating expenses, and that provisions be made for the religious practice of the slaves. None of these conditions was met. Aided by a few sympathetic Jesuits, some of the slaves escaped as the sale and transfer were underway.